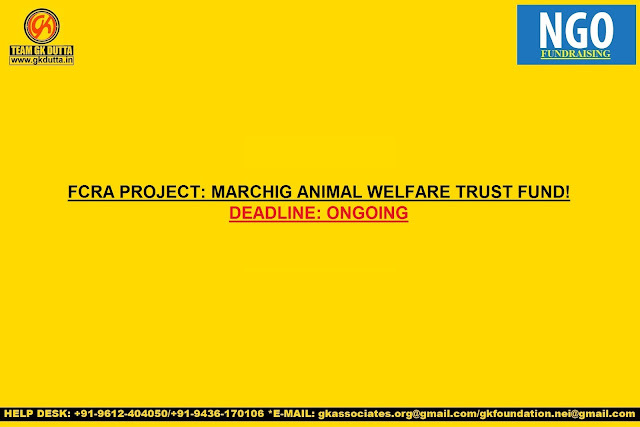 FCRA PROJECT: MARCHIG ANIMAL WELFARE TRUST FUND! The Marchig Animal Welfare Trust is currently seeking applications from organisations or individual for its Grant Programme, with an aim to promote and encourage practical work in preventing animal cruelty and the relief of animal suffering. · There are no restrictions on the geographical area of the work (with the exception of the USA and Canada), the type of grant, or the applicant. · Those encouraging initiatives designed to improve animal welfare. · Those promoting alternative methods to animal experimentation and their practical implementation.